Claus Zimmerman, teacher from southern Germany told me not to take the old cobbled road down the other side of the Gotthard Pass. Claus (different Claus by the way from Stuttgart Claus who I met up with in Strasbourg) was in the next pitch to me on the campsite at Andermatt. He too was cycling in the direction of Italy and we passed each other several times on our way up to the pass this morning. At the top we waved our goodbyes to each other and he passed on the advice about the best way down. Initially I followed his recommendation but within a couple of minutes, I could see the old road below me. What an iconic view! Why wasn’t I on that road and not this boring dual carriageway that would hurtle me to the bottom at break neck speed? I turned back and set off down the old cobbled road. It was slow going; the cobbles didn’t allow a bike to travel quickly downhill. The views were amazing and I paused frequently to close my jaw which had dropped many times. After about ten minutes on the cobbles I head a hard click. I looked around at the bike and couldn’t see anything wrong… so I continued. But something was badly amiss. I stopped again, got off the bike and investigated. One of the spokes on the rear wheel had broken. Damn! This was serious. I could change a punctured inner tube, perhaps even repair a snapped chain, but repairing a spoke was in the premier league of abilities. And I wasn’t. Worse than just the spoke, the entire back wheel had taken on a very large wobble. Near the top of a mountain, without the technical skills to help myself, I was stuffed. I tentatively continued to cycle along the switch back roads. Most were still cobbled so goodness knows what new damage I was inflicting on poor Reggie. Far below me I could see the small town of Airolo; I could only pray that there was a bike repair shop in town. At times I got off and pushed, on better quality stretches I dared to ride, conscious of the time; it was already mid afternoon. Eventually I arrived in Airolo. Not the kind of place to have a bike shop. Lots of restaurants and bars, very few places of practical use. In my best Italian as I was now in Ticino, I asked a chap on the street if there was a bike shop in the town because I had a problem with my bike. He must have been impressed with my linguistic skills as he gave a full answer in Italian of which I caught the most important but; go down there mate, there are lots of…. bars and restaurants. Perhaps he mistook my urgent requirement. I did follow his suggestion but in my mind were images of having to take the bike on a train to Milan to get it sorted. Would I be so committed to the cause to return to Airolo and continue on the Eurovelo 5 route? My mind was not made up. Needless to say, there was no bike shop. Then, as I was about to start thinking about the next train south, I noticed a sign saying, in English ‘Rent a Bike’. It was a long shot but perhaps they could help me out. I wandered over to the building which was immediately next to one of the station platforms. The door was open; to my left was a large room with probably around 200 almost identical yellow bikes ready for hire. To my right was half-opened door. I knocked and it opened slightly more; it was a fully equipped bike repair workshop. Amazing! Only one problem; there didn’t seem to be anyone around.I wandered outside and then a couple if railway workers pointed behind me; someone had appeared. It turned out to be the guy who worked there. We agreed on French as a language of communication and he quickly informed me that it wasn’t an easy problem to fix. I told him I would pay and his fears seemed to subdue a little. I stripped Reggie of his baggage and my new friend set to work. He was clearly a chap who knew his bikes and within seconds he had the wheel dismantled and was removing spokes from another wheel that he had in the workshop. Fascinating but at the same time terrifying to watch; wad he going to stop and say ‘sorry mate it’s buggered’? He didn’t but continued to work diligently without ever once removing the cigar from his mouth. Then came the ‘bouquet final’ when he started to balance the wheel. With the precision if a piano tuner fine tuning his instrument, this guy delicately tweaked the necessary spokes to give me a perfectly balanced wheel. Before I could blink, he had the wheel back on Reggie, tyre pumped up and was even checking the brakes; back and front! He said 40€ and I didn’t argue. I sincerely hope that the money went straight into his pocket. My bike was fixed and I was in with an excellent chance of making it to Bellinzona by the end of the day. Which is what I did, despite the strong wind trying to keep me pinned back towards the mountains. And who should I bump into at the campsite? Claus Zimmerman of course. I told him I would always follow his advice in future; he then suggested we had a beer. I followed his instruction to the letter! My goodness what an adventure ! Congrats on the climb..it looks amazing..I’d still opt for the cobbles I think, and lucky me, I never seem to have many ‘mechanicals’ on long trips, punctures and brake pads only, in thousands of k’s.. Unllike some of my companions who spend as much time looking for bike shops as anything else,…on the camino tho’ they were never too far away and always people were glad to help..speedilly, and the cost was always minimal. 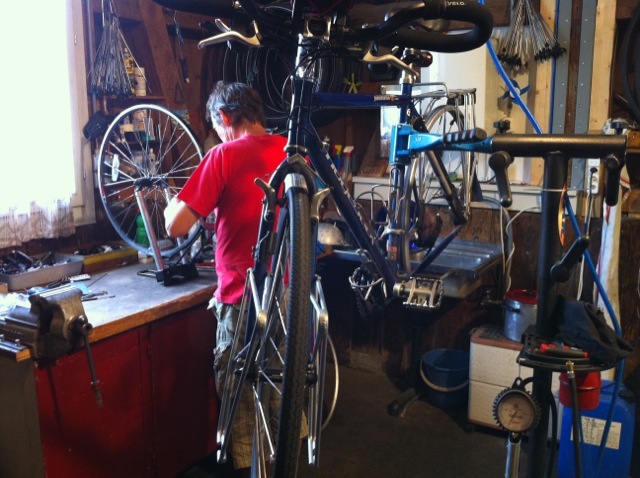 He built my 36 spoke touring wheels for my bike build and they are really top notch wheels! I’ve had spokes go on my older hybrid but not when I had any load on it making it not as big a pain. The rear wheel seems to get worse out of shape than the front when a spoke goes, maybe it is to do with the weight over it. I think I’ll get some spare spokes for my wheels not that I think I’ll be able to do much with them but I can at least have a shot if I can’t find someone else with more skill in close proximity to wherever I might have a problem. If it happens again loosen the rear brake off so the wheel can turn freely without rubbing against the brake blocks making it easy to move on. But remember you are down to only a front brake! It does look amazing watching a skilled wheel builer putting a wheel together. A good practical skill. So, for those of us following, what would your advice be? Take the old or new road? Broken spokes are a fairly common occurance (I broke 6 in 8000 miles on my ridgeback, all rear, all drive side (the side with the cogs that makes changing them yourself difficult)) I now carry spares and an NBT tool in case on a long trip but it is quite a tricky undertaking. Touring bikes have a lot of spokes so one breaking will usualy see you to the next town. Is Claus the brother of ‘Freewheelin’ Bob Dylan ?